The Irish football governing body made the announcement this evening. John Delaney believes the appointment of O'Shea will improve the association. THE FAI HAS this evening announced Sarah O’Shea as deputy chief executive of the association. A qualified solicitor who has worked with the FAI since 2006, O’Shea has previously held the position of company secretary and is currently director of legal affairs, while she also works as chairperson of the Federation of Irish Sport and a panel member in the Court of Arbitration. “We are embarking on another important phase for Irish football and I am keen to play a valuable role, particularly in the administrative and organisational aspects of the Association as deputy to the CEO,” O’Shea said. John Delaney added: “Since Sarah’s appointment in 2006 she has made a substantial contribution to the management team. She has been an excellent legal director, establishing the legal department and reforming the Association’s disciplinary processes”. As the governance and administrative needs of the game change, the FAI continues to adapt its structures and Sarah’s appointment is part of that process. 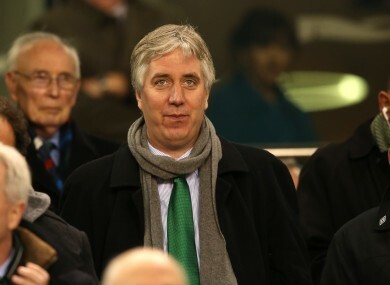 Email “FAI appoints Sarah O’Shea as John Delaney’s deputy CEO”. Feedback on “FAI appoints Sarah O’Shea as John Delaney’s deputy CEO”.